This entry was updated in 2015, please click here for the new feature! 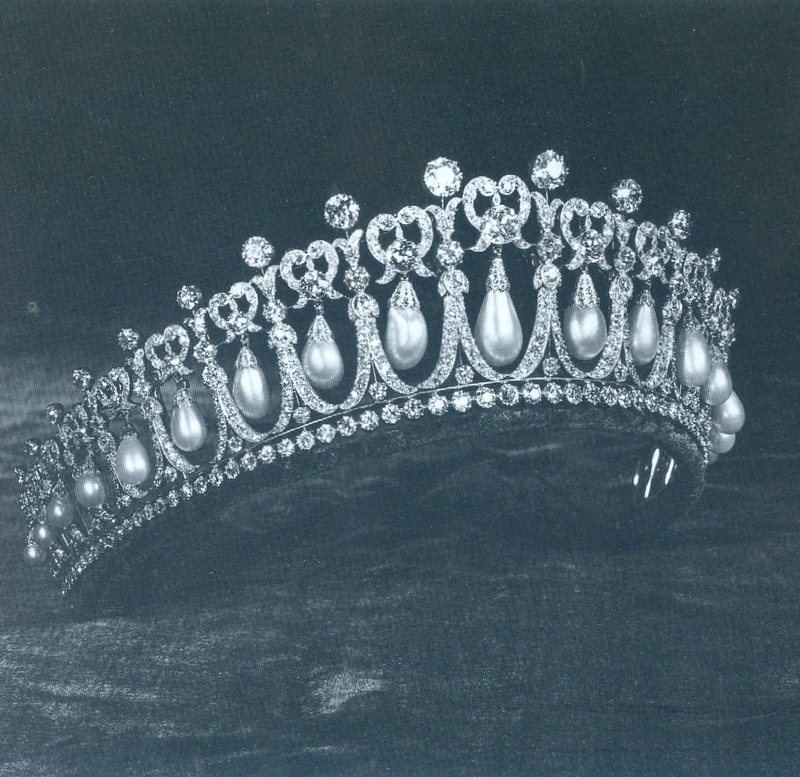 And now, for our second installment of Tiara Thursdays, we move to one of the most famous tiaras in the collection: the Cambridge Lover's Knot Tiara. This gem was commissioned from Garrard in 1913/1914 by everyone's favorite magpie, Queen Mary. She modeled it off of a tiara owned by her grandmother, Princess Augusta of Hesse, the Duchess of Cambridge. It wasn't a unique design to begin with; several others exist that are quite similar. The piece passed from Princess Augusta to her daughter (also named Augusta), who became Grand Duchess of Mecklenburg-Strelitz. Left to Right: Princess Augusta of Hesse, the Grand Duchess of Mecklenburg-Strelitz, Queen Mary with upright pearls, Queen Mary without upright pearls. 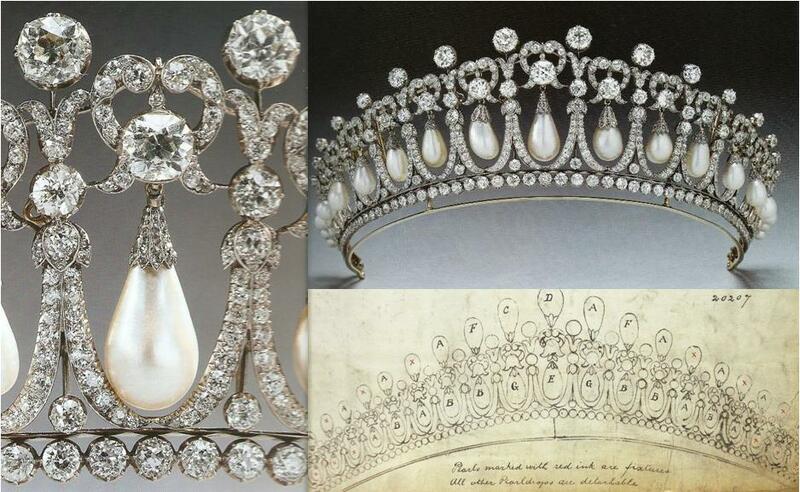 Swinging pearls hang from 19 diamond arches capped with lover's knots in this tiara. The piece was composed of existing jewels Queen Mary had in her collection: the dismantled Some Ladies of England Tiara plus the original pearl uprights from the Girls of Great Britain & Ireland Tiara and pearls off of a couple brooches belonging to Mary which were ultimately returned. Originally, the design included upright pearls on top of the arches, but Mary had them removed eventually. 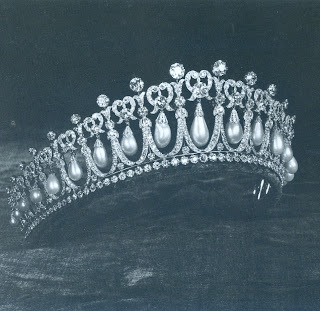 After Mary died in 1953, the tiara passed to Queen Elizabeth II. She wore it with some regularity in the early 1950s, but it eventually went back to storage as she narrowed down her favorite tiaras to the ones we see with regularity today. Next up, the best known part of our tale: the Queen loaned the Cambridge Lover's Knot tiara to Diana, Princess of Wales as a wedding present in 1981. 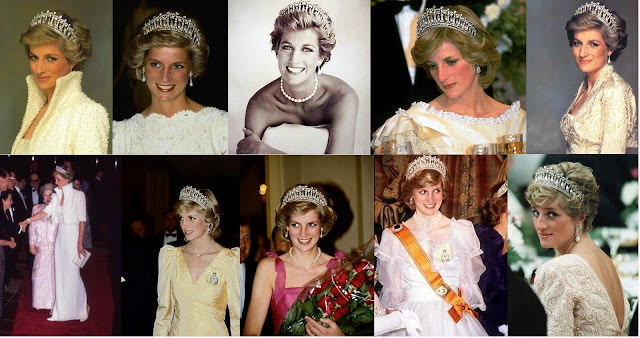 Diana famously found the piece to be too heavy and headache-inducing, and often opted to borrow the lighter-weight Spencer tiara from her family instead. (I don't blame her for searching out a second tiara option. With the swinging pearls, this one had to be tricky to wear.) As this was a loan and not a part of Diana's personal property, it is now back in the collection of the Queen. Update: And in 2015, we finally saw the tiara again. The Queen loaned it to the Duchess of Cambridge, who wore it for a diplomatic reception at Buckingham Palace. Like many, I thought Diana's signature tiara would rest in the vault for a longer period, but I'm happy to see it back in action. This tiara was voted #5 on your list of Top 15 Favorite Tiaras!